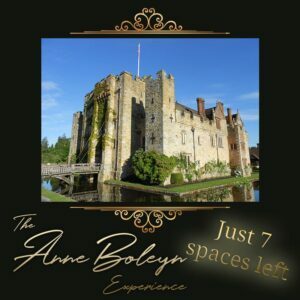 Just a quick post to let you know that Philippa has just taken another booking so there are only 7 spaces left on this year’s Anne Boleyn Experience tour. You can secure your place with a deposit on the tour page – click here. I am quite literally counting the days to this year’s tour (118 days!) as I can’t wait to be back at Hever Castle and to be talking Tudor with people who love Anne Boleyn and all things Tudor as much as I do. It’s also a real pinch-me moment and an absolute honour to talk about Queen Anne Boleyn at her home. I do get rather choked (note: pack tissues)! Here are some details about the tour if you have missed my previous posts about it. Stay at Anne Boleyn’s home for the duration of this 4 night Anne Boleyn Experience tour focusing on the life and death of Queen Anne Boleyn, second wife of King Henry VIII and including a visit to the site of her execution. During the tour you will visit three Tudor landmarks: Penshurst Place, the Tower of London and Hever Castle, where you will be staying for the duration of the tour in a private wing for our exclusive use. It really is amazing to wake up each morning and be able to stroll around the grounds before breakfast or go for a moonlit walk after dinner, it’s out of this world! The tour is led by Claire Ridgway of The Anne Boleyn Files and The Tudor Society, and Philippa Lacey Brewell of British History Tours and British History with Philippa Lacey Brewell. Special perks: Claire Ridgway (that’s me!) is on hand for the whole tour to grill about Anne Boleyn – I’m a night-owl so don’t mind staying up and talking Tudor all night! Philippa, the Queen of Organization is on hand all of the time to help you (she’s such a whiz!). We eat in the main castle dining room on one of the nights, we have out-of-hours access to the grounds and a private out-of-hours tour of the castle. It really is amazing. Hello Claire….Oh how I would love to join you on The Anne Boleyn Experience, but a year ago in May my dream came true & I found myself in England visiting the Tower of London, St. Peter’s church, & then Hever Castle. I sat in the courtyard at Hever Castle breathing in the air, lightly touching the walls & overwhelmed by the very fact that I was right there, in the very place that Anne walked, laughed, cried, lived. It was an amazing moment. I was also lucky enough to be at the Tower of London on May 19th, the anniversary of Anne’s execution & was moved to tears watching a poignant drama of her trial. Anne has been my heroine since age 12. I have read, studied, & watched so many documentaries & movies about her life & times. What a joy it would be to be in the company of kindred spirits who share my love of all things Tudor.